Preheat the oven to 325°. In a medium saucepan of salted boiling water, blanch the zucchini and asparagus for 1 minute, then drain well and pat dry. In a large bowl, beat the eggs with 1/2 teaspoon of salt and 1/4 teaspoon of pepper. Stir in the vegetables. In a bowl, season the ricotta with salt and pepper. In a 12-inch ovenproof nonstick skillet, heat the oil. Add the egg-vegetable mixture and cook over moderately low heat, stirring occasionally, until starting to set at the edge, 3 minutes. 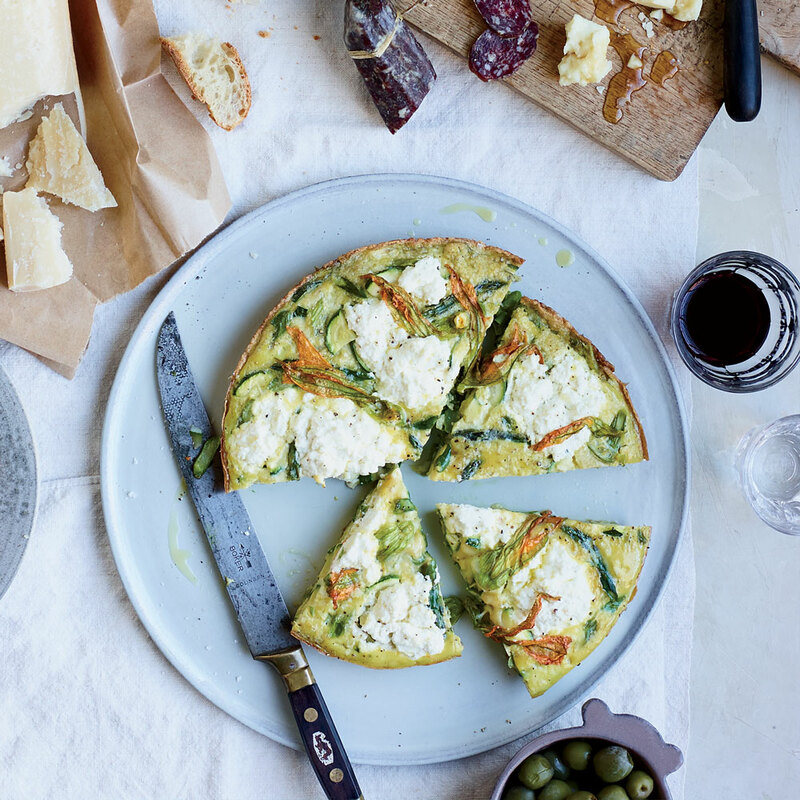 Dot the ricotta on top and garnish with the zucchini blossoms, if using. Transfer the skillet to the oven and bake for 20 to 25 minutes, until the frittata is just set. Let cool slightly, transfer to a platter, cut into wedges and serve. Sliced salumi, pecorino cheese drizzled with honey, dried or fresh fruit, and crusty bread. Review Body: I prefer spaghetti frittata. Review Body: To be honest, I've tried this before and it's not that good.